Surely, I’ve thought to myself, all these many months that I’ve been posting here — surely, I’ve already written about semolina bread. It is, after all, a perennial favorite in this house. It is, after all, a regular in my bread rotation. But I did some searching through the archives yesterday, as I was thinking about what to make for you all this week. And I discovered, to my horror, that the answer is apparently not. Apparently, I have posted none of my many semolina bread variants here. So, then: today is the day. 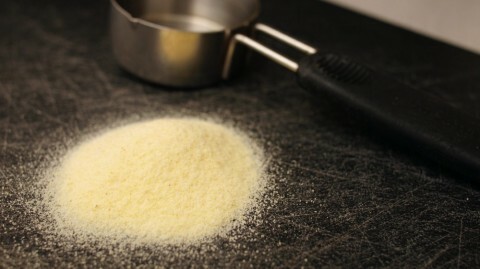 To give you some context, semolina is a coarse, golden flour that is ground from hard durum wheat. We tend to think of it as that stuff that goes into pasta. But it’s actually pretty versatile. It gets used to make sweet puddings and porridges in Europe and the United States. In Southern India, it gets turned into delicious Rava Dosa. And I have it on good authority from a reliable friend that it gets used instead of cornmeal to make a mean polenta in Bulgaria. It turns out (according to some research that I just now did), that semolina is actually the same thing as Cream of Wheat. Or, at least, it’s the same process. Cream of wheat is made from a soft wheat, which is (apparently) why it’s white. But if you’ve ever looked at those sandy granules of … hm … and wondered: what is that, and where exactly is the wheat? Now you know. The wheat berries are pulverized to grits rather than being ground to a fine powder like ordinary flour, and there you have it. Cream of Wheat. At any rate: yes, there are lots of wonderful things that you can do with semolina. And yes, as far as I’m concerned, bread is up there with the best of them. My semolina bread recipe started out, years and years ago, as a formula from bread savant Peter Reinhart, in his truly excellent book on technique — The Bread Baker’s Apprentice. Over time, I’ve moved away from his specifications, changing the hydration of the dough and the white-to-semolina proportions, and adding some flavorings (achem — truffle oil!) that I think uniquely complement the grain. Reinhart calls his bread Sicilian, and I’m calling mine Italian — at least for now. In neither case, as far as I can tell, is the provenance strictly true. But semolina bread makes such an excellent pairing with Italian food, and its tastiest features are so enhanced by Italian-esque flavorings, that that (dear readers!) seems like as good a name as any. Unless you have some better suggestions, why not? The night before: add the yeast, semolina flour, and 300g of the water to the work bowl of your stand mixer (or to a medium-sized mixing bowl, if you’re doing this by hand), and stir together until all the lumps are dissolved. Cover, and allow to stand for at least twelve hours. The day of: add all the rest of the ingredients, except for the Parmesan cheese, to the work bowl. Using the stand mixer’s dough hook, on the lowest setting, mix all the ingredients together until you have a shaggy dough. 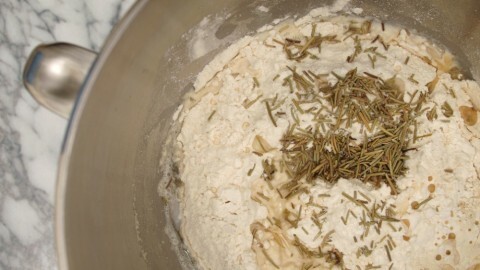 Then turn the mixer up to low-medium and knead for 10-15 minutes (about 20 minutes by hand) until the dough’s texture becomes smooth and springy to the touch. 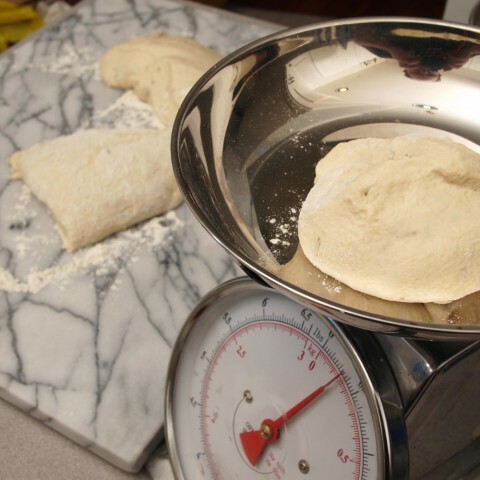 At the end of the three hours, gently move the risen dough ball to a floured pastry board or counter. Using a knife (or dough scraper), divide it into six even pieces (a scale will make this much easier — they should be about 150g apiece). 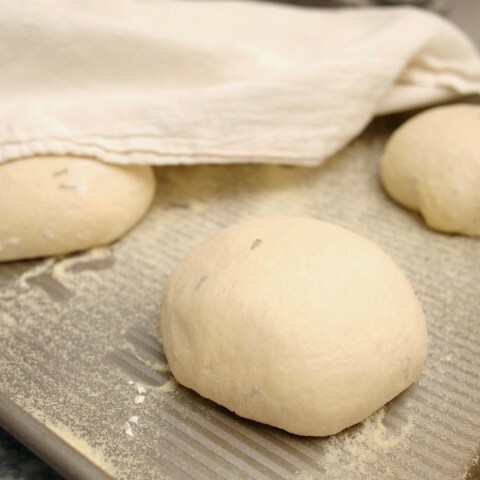 Stretch (you want to stretch the dough, such that it has surface tension) each of the pieces into round balls, sealing off the seams at the bottom. Then move the balls onto a cookie sheet dusted with a couple of tablespoons more semolina flour, spacing them evenly apart. Cover with a moist tea towel, and proof for 1 hour and 10 minutes. 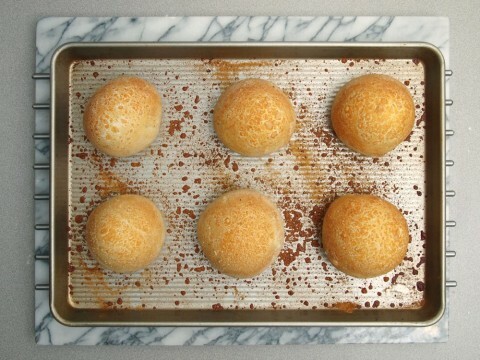 While the rolls are proofing, preheat your oven to 450F. 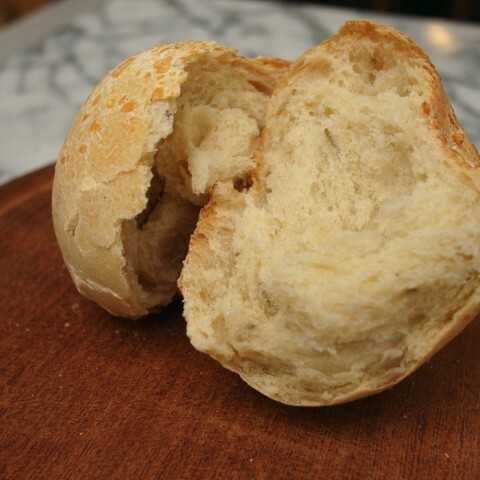 At the end of that time, remove the tea towel, and moisten each of the rolls with a little more water. Sprinkle them with the Parmesan cheese. And put the whole cookie sheet into the oven for 20-25 minutes, until they have turned golden brown and the cheese has gone crusty. Allow them to cool thoroughly before serving.